Where did the AccessArt Village Come From? The end of 2018 also says goodbye to the AccessArt Village and this special project which started with a gift to AccessArt, from Appletons Wool, of a huge box of wool, which arrived on our doorstep in February 2016. In a spontaneous moment, Paula Briggs, co-director of AccessArt, invited followers of AccessArt to join in the creation of an artwork ‘celebrating the diversity’ of the AccessArt community. 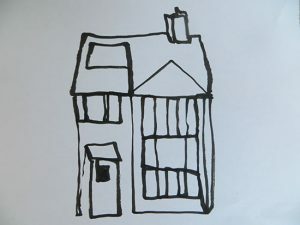 Paula invited participants to draw a simple image of their own home and to ‘sew the image on a 20cm square of fabric’ and then send it back to AccessArt. 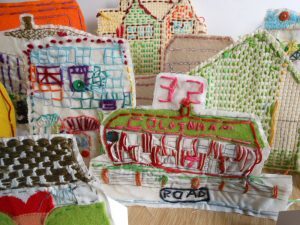 The individual houses were then to be ‘brought together by a textile artist’ in ‘one amazing artwork’. And that was how the AccessArt Village began. Little did Paula know that her email invite would lead to a project spanning almost three years and the sparking of creative responses from almost 700 individuals, from all walks of life and ages. A true celebration of individuality, community and creativity. The AccessArt was ran by #TeamAccessArt, host galleries and participants on a voluntary basis with no renumeration for time and effort. The project is now closed for submissions. We received over 700 sewn squares, from all kinds of audiences all over the world. Paula’s initial way to excite creativity and get the project underway was to create a series of resources to kick start the project and enable AccessArt followers to easily participate. Paula wanted to encourage participation across all ages and abilities from art novices to experienced artists. Paula was then joined by artist Andrea Butler, in creating a series of resources to inspire creative actions. 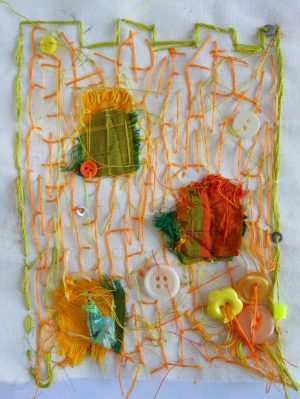 This resource provided the starting point for the project and how to make a sewn square. 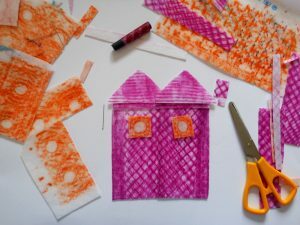 Andrea Butler shows how to use fabric rubbings and simple stitching to make a colourful collage of a home. 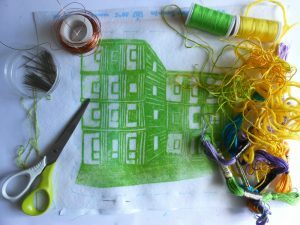 Andrea Butler combines making a collagraph print with fabric and stitch to create a 2D image which could then be used to make a sculptural model house. 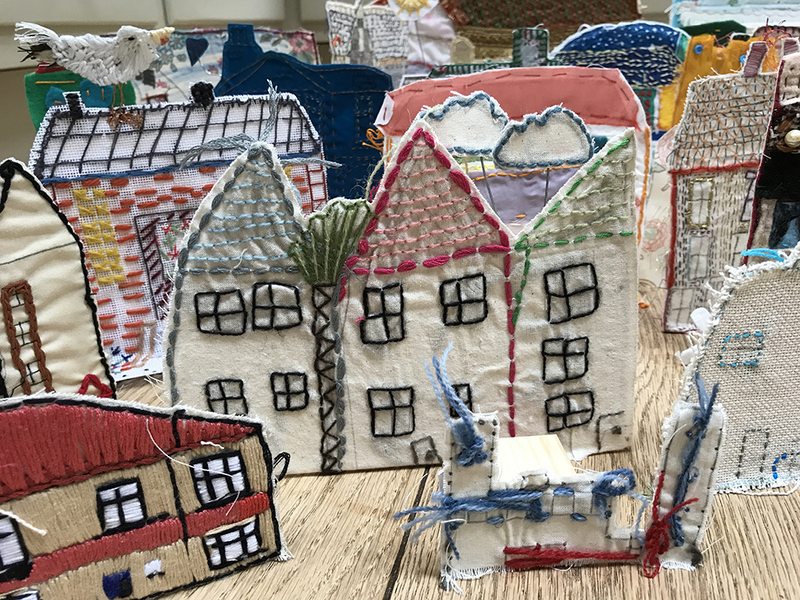 This resource marks the turning point of the AccessArt Village Project and when the idea took off for the stitched houses to be transformed into 3D stand alone pieces. In this post Andrea Butler shares with participants the process. The AccessArt Village came to life when sewn houses started to arrive back. The magnitude of the response to the call was incredible, with almost 700 houses arriving back to AccessArt from a broad spectrum of venues including schools, hospitals, libraries, Brownie groups, Art clubs, Art groups and galleries from all around the United Kingdom and as far as South Africa. Andrea Butler, from #TeamAccessArt, donated vast amounts of time, ingenuity and creativity to the project. Over the course of a year, she lovingly and painstakingly mounted the houses. Every house was given its own time and great attention was paid to detail. Andrea used her creative sensitivity to respond to the originality of each piece and all the houses were treated equally and with great and equal respect, whether made by a young child or established artist. Andrea was joined by Paula and Sheila Ceccarelli over the summer of 2017 to complete the task of mounting the houses. 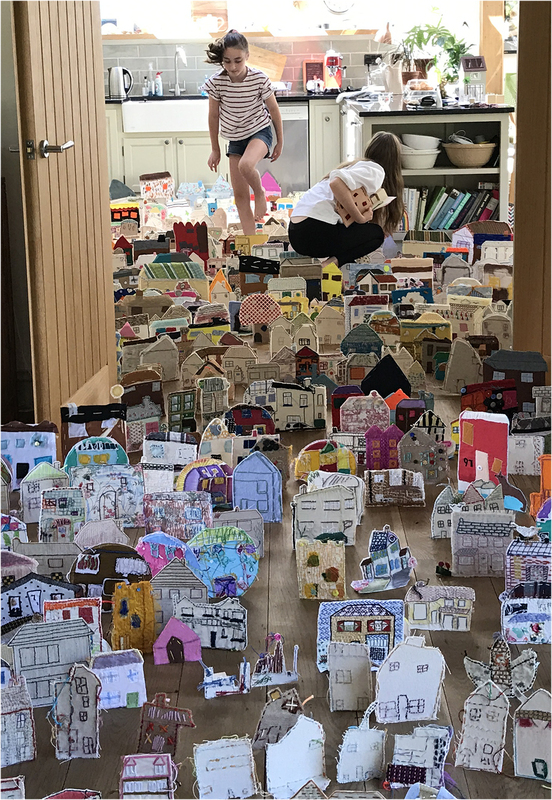 The result of all this hard work and participation was an installation of over 700 3D models which juxtaposed work by children at the start of their creative lives next to that of accomplished artists and older generations. Whilst highlighting the character and individually of each piece, the project celebrated diversity and reminded us of the universal sanctity of “home”. Most poignant were those houses contributed by individuals who, for reasons of health or vulnerability, were away from home when they made their creations. Seeing how enthusiastically the project was being received by the AccessArt community, in January 2016, Paula sent out another email calling for ‘Host Partners’ to exhibit the AccessArt Village. The call was met with an enthusiastic response from schools and galleries across the county. The variety venues to respond to the call demonstrated the breadth of AccessArt’s engagement with its community and also the geographical span of its reach. September 2017 to November 2018: The Village went on tour! 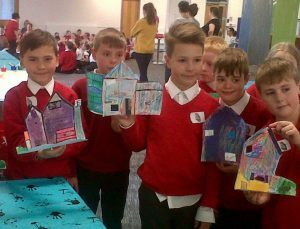 One of the highlights of the AccessArt Village Tour when Sheila Ceccarelli worked in Mansfield Central Library with children from Berry Hill Primary School. 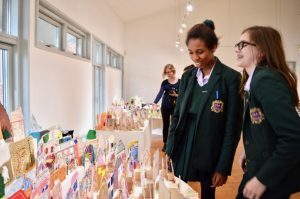 This AccessArt workshop was led by Sheila Ceccarelli for year nine students at Frances Bardsley Academy in Romford, where the The AccessArt Village was displayed in the school’s adjacent Brentwood Road Gallery, in January 2018. 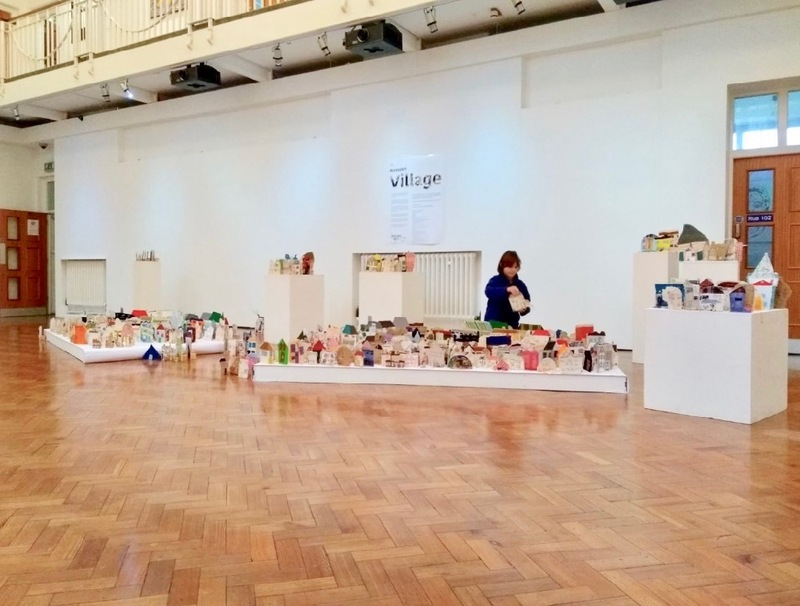 The very special homes, handmade by children in schools and hospitals, artists, young people and community groups, were exhibited and sold, in collaboration with Emmaus, Homeless Charity, Cambridge. Rachel Hurcomb & 1st Stretton St Mary’s Brownies, Sarah Williams & 1S, St John’s College School, Pupils from King’s Worcester School, Amber Smith, Chailey School, Jean Goodall, Barbara Latham, Jill McDermott, Julie Ashfield, Evonne Bixter & pupils from St Augustine of Canterbury Catholic High School, Natti Russell & members of Art4Space, Sharon Gale & The Art Cabin at Northaw C of E Primary School, Morgain Murrey Williams & students from Chesterton Community College, Jo Evans & Yr 2, Southbank International School, Victoria Lowe & pupils from Eyemouth High School, Helen Walsh & The Heathlands Project, Tullie Textiles, Tullie House Museum and Art Gallery, Beth Shearing, Louise Shenstone & “Making It’, Rhondda Cynon Taf, Kate Gwen Jones & Yrs 9, 10 and 11 Art Textiles, Stanley Park High School, Megan Stallworthy & pupils from Sticklepath Community School, Liz Cook & children from Great Ormand Street Hospital, Heather Wilson, Isabel Brown, Rosie James & pupils at Dent C of E Primary School, Annabel Johnson & the Children’s Art School Wimbledon, Helen Jones & Yr 8 textile students, George Salter Academy, Sam Downer & pupils from St John’s College School, K Sellens & pupils from Lansbury Lawrence Primary School, Andrea Butler, Craft and textile groups, Inspire: Culture, Learning and Libraries, Notts, Yr Four pupils, Berry Hill Primary School, Morag Thomson Merriman, Sandy Wright & pupils from All Saints Anglican/Methodist Primary School C Wimberley & The Art Club, Poppleton Rd Primary School, Jacqui Stewart & the Cotton Candy Art Group, Helena Malan & pupils from Eureka Primary Grade Eight, Burgersdorp, Reg. Charity No: 1105049 South Africa. Hi I really like this village and want to include our homeless hostel . We will be having a go at doing some squares, thanks for the invite!! What a great idea. The children here at St John’s are very excited to be taking part. Thank you for being so inspiring. Hello Rachel, Absolutely all of it fine! Free motion embroidery sounds amazing! Thank you. Hello, I would love the children at the school I am a trainee at to be involved with your project. The school may want to order wool from its usual suppliers; is this ok? can we still take part? I have a student who would like to appliqué fabric onto her house for the AccessArt village square, as well embroidery, is this OK? Hello Dawn, that’s absolutely fine – it sounds a lovely combination of techniques and we really look forward to seeing your student’s work! What are your plans for showing the completed creation? Hi Debbie, the deadline isn’t until the end of April so you’ve plenty of stitching time!…Just the thing to be doing during this snowy, winter weather 🙂 Look forward to seeing your house – thanks for supporting the project! I am teaching art in Bangkok and was thinking this could be good with my elementary students. I was also thinking to exhibit work here then send, What is last date you need work by?